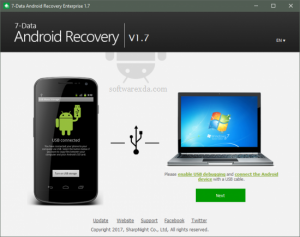 7-Data Android Recovery Enterprise (now Disk Drill!) uses powerful new technology that will help you recover lost data from your Android device. This is made possible with our easy-to-use Android data recovery software. With the free data recovery software, you can retrieve data lost from your Android devices, regardless if they were lost due to corruption or accidental deletion. Ever wonder how to recover deleted photos from Android? Wonder no more, 7-Data Recovery (Disk Drill) can help recover deleted files on Android (and many other platforms). You can get started with Android data recovery free of charge with our powerful software. 7-Data Recovery is designed to recover several formats of images from your Android phone. Just a few popular formats available for Android photo recovery include JPG, JPEG, PNG, GIF, and more. However, our file recovery software is also capable of retrieving other types of files in various formats. In fact, just about any type of file can be recovered, such as: documents, videos, music files, emails, apps, databases, and more. Please note: Disk Drill for Windows is not yet capable of detecting Android devices, however Disk Drill for Mac provides full support for Android data recovery and has you covered. 7-Data Recovery is designed as a DIY software and is simple to use. This helps you recover your important files on your Android device without the need for complicated equipment or difficult technical solutions. All you need is an Android phone connected to your computer in “Mass Storage” mode and you are ready to begin. Enable “Mass Storage” mode on your Android device, this is often done via “Developer Mode Settings” on your Android device. Connect your Android phone to your Windows computer, the phone should now be detected and visible as a storage device, just like a USB drive or memory card! Open the Disk Drill software and look for your Android phone (connected as Mass Storage). Click “Recover” next to the phone and smile, you just become a data recovery champion. If your Android device does not support Mass Storage Mode, you will need to root it before your lost data can be retrieved. Disk Drill will conveniently guide you through the process. It’s that easy, you can stop worrying about how to recover deleted photos from Android. Still wondering how to recover deleted text messages Android? No need, you’ve already figured it all out. The above steps apply to all file types on your Android device, please do remember, files are recovered in their raw format. Some file types like text messages may need to be moved back to their original source to be viewable. 7-Data Recovery (Disk Drill) is designed to be flexible and read just about any connected media device. This means that any Android device capable of going into “Mass Storage” mode can be read, even if running an older version of Android. Even if your device is a tablet or other storage appliance running Android it can still be recovered! Disk Drill supports many types of devices including Android Tablets, Android TV Boxes and just about anything else you can connect to your computer.